Julian Assange was arrested in England on Thursday. Though nothing has been announced, there are reports he may be extradited to the United States to face charges related to Obama-era actions. The Post editorial of years back is still relevant because Assange is being tried for an “offense” almost a decade old. What’s changed since is the public perception of him, and in a supreme irony it will be the government of Donald “I love WikiLeaks” Trump benefiting from a trick of time, to rally public support for a prosecution that officials hesitated to push in the Obama years. Much of the American media audience views the arrested WikiLeaks founder through the lens of the 2016 election, after which he was denounced as a Russian cutout who threw an election for Trump. But the current indictment is the extension of a years-long effort, pre-dating Trump, to construct a legal argument against someone who releases embarrassing secrets. Barack Obama’s Attorney General, Eric Holder, said as far back as 2010 the WikiLeaks founder was the focus of an “active, ongoing criminal investigation.” Assange at the time had won, or was en route to winning, a pile of journalism prizes for releasing embarrassing classified information about many governments, including the infamous “Collateral Murder” video delivered by Chelsea Manning. The video showed a helicopter attack in Iraq which among other things resulted in the deaths of two Reuters reporters. The indictment unveiled today falls just short of a full frontal attack on press freedoms only because it indicts on something like a technicality: specifically, an accusation that Assange tried (and, seemingly, failed) to help Manning crack a government password. For this reason, the language of the indictment underwhelmed some legal experts who had expressed concerns about the speech ramifications of this case before. “The weakness of the US charge against Assange is shocking,” tweeted Edward Snowden. Part of the case clearly describes conduct that exists outside the normal parameters of press-source interaction, specifically the password issue. However, the evidence about this part of the conspiracy seems thin, limited mainly to Assange saying he’d had “no luck so far,” apparently in relation to attempts to crack the password. Reporters have extremely complicated relationships with sources, especially whistleblower types like Manning, who are often under extreme stress and emotionally vulnerable. At different times, you might counsel the same person both for and against disclosure. It’s proper to work through all the reasons for action in any direction, including weighing the public’s interest, the effect on the source’s conscience and mental health, and personal and professional consequences. For this reason, placing criminal penalties on a prosecutor’s interpretation of such interactions will likely put a scare into anyone involved with national security reporting going forward. Unfortunately, Assange’s case, and the very serious issues it raises, will be impacted in profound ways by things that took place long after the alleged offenses, specifically the Russiagate story. It’s why some reporters are less than concerned about the Assange case today. Not only did this case have nothing to do with Russiagate, but in one of the odder unreported details of Special Counsel Robert Mueller’s investigation, he never interviewed or attempted to interview Assange. In fact, it appears none of the 2800 subpoenas, 500 witness interviews, and 500 search warrants in the Mueller probe targeted Assange or WikiLeaks. According to WikiLeaks, no one from Mueller’s office ever attempted to get a statement from Assange, any WikiLeaks employee, or any of Assange’s lawyers (the Office of Special Counsel declined comment for this story). A Senate committee did reach out to Assange last year about the possibility of testifying, but never followed up. Throughout the winter I asked officials and former prosecutors why officials wouldn’t be interested in at least getting a statement from a person ostensibly at the center of an all-consuming international controversy. There were many explanations offered, the least curious being that Assange’s earlier charges, assuming they existed, could pose legal and procedural obstacles. Now that Assange’s extant case has finally been made public, the concern on that score “dissipates,” as one legal expert put it today. It will therefore be interesting to see if Assange is finally asked about Russiagate by someone in American officialdom. If he isn’t, that will be yet another curious detail in a case that gets stranger by the minute. 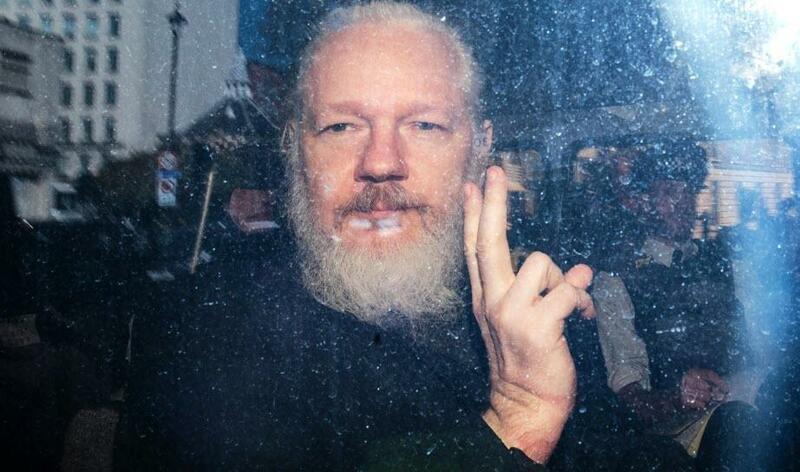 As for Assange’s case, coverage by a national press corps that embraced him at the time of these offenses — and widely re-reported his leaks — will likely focus on the narrow hacking issue, as if this is not really about curtailing legitimate journalism. In reality, it would be hard to find a more extreme example of how deep the bipartisan consensus runs on expanding the policing of leaks. Donald Trump, infamously and ridiculously, is a pronounced Twitter fan of WikiLeaks, even comparing it favorably to the “dishonest media.” His Justice Department’s prosecution of Assange seems as counter-intuitive as the constitutional lawyer Barack Obama’s expansion of drone assassination programs. Both things happened, though, and we should stop being surprised by them — even when Donald Trump takes the last step of journey begun by Barack Obama.